My #1 source would have to be Twitter. The collaboration between #pegeeks/#physed teachers is absolutely amazing. Funny story: the only reason I even joined Twitter to begin with (I was totally anti-Twitter thinking what can you possibly say in 140 characters) was because my girlfriend convinced me to give it a try. I suppose I have her to thank for getting me involved in such a supportive and well-intentioned group of PHE professionals online! 1) Various websites – http://physedgames.com/ by @PhysedGames, http://thephysicaleducator.com/ by @JoeyFeith/@phys_educator, http://thepegeek.com/ by @mrrobbo, http://pecentral.com, and many, many others! For the most part, I teach implementing elements from the TGfU Model (Teaching Games for Understanding). My units are typically broken down by either Invasion/Territorial, Net/Wall, Striking/Fielding, or Target games. Within each unit, I also consider which sports I’m aiming to build up to in order to decide on the appropriate games/activities for the class. 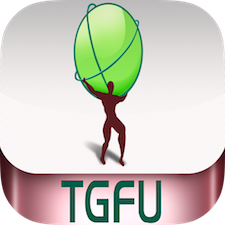 Since I am borrowing elements from the TGfU Model, my lessons tend to be layered and include many variations, modifications, & progressions. Additionally, although skill is taught, the primary focus is on strategy and tactical awareness. Both of these areas are typically covered either at the end of class with a brief discussion or even after a certain game/activity depending on the complexity of it. Sometimes, I even interject in the middle of the activity for no more than 30 seconds if I feel the need to accentuate certain details before restarting the game again. Overall, both my students and I care about one another and this working relationship fosters growth and development without the fear of scrutiny while providing a safe environment. This makes for lots of fun and lots of laughter all while learning in the process. I almost always start a lesson with a game of tag to warm up. Tag is one of those basic games/activities that everyone knows the main premise of the game despite the rules that may be introduced. Regardless of the age, chasing friends and fleeing from others always seems to spark excitement levels (and movement levels!) at least in my experience. 1) I try to give my students choices within reasonable limits. For example, I often put the onus on the children to form “equal” teams to the best of their abilities – I make changes if need be, but most of the time, no changes are necessary! 2) I’m not afraid to be a kid every once in a while. As a teacher, most of the time is spent instructing, observing, analyzing, assessing, but every so often I’ll jump into the activity and simply play. My students tend to appreciate the enthusiasm and heck, who doesn’t enjoy either working with or going against their teacher every now and then!? There are 3 pieces of teaching advice that have been instilled in my teaching methods. 1) Lesson planning – always over-plan. 2) Check for understanding after explaining the activity – ask the children to answer questions that they would likely ask you concerning the activity on deck. 3) Above all else, no matter what subject you teach, remember that you ultimately teach children. « Wrap-Up & App Giveaway!